How important is formal education? 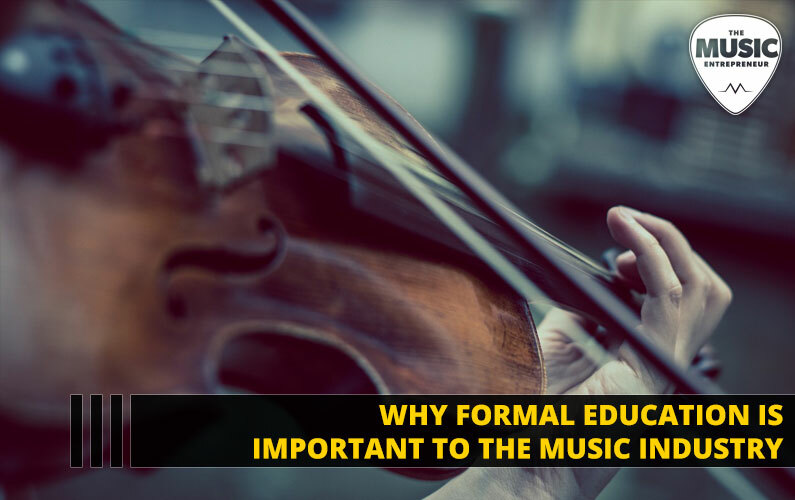 Should every musician receive training in an educational context?In this post, guest contributor Claire Temple helps us understand the value of formal education for both musicians and the industry at large. Do you have something to share with our audience? Consider becoming a guest contributor for The Music Entrepreneur HQ. With that, here’s Claire to enlighten us. Although many successful self-taught musicians exist, I personally believe formal music education can unleash the true talent of a musician. This doesn’t mean getting music education is better than being self-taught. But music education can help you shape your musical path and “tame” your creativity. Among other things, music education doesn’t just provide an intensive introduction to music theory, but most importantly, exposes the student to the cultural basis and implications of music in general. This knowledge is valuable not only to the musician but also to the broader music industry in which they operate. Here is how and why. Are There Advantages to Not Having Formal Music Training? Before we explain the importance and benefits of music education, we should discuss if there are any advantages to not having music training. Being self-taught is often associated with being adventurous and genius, while formal music education is associated with rigidity. It is wrong to think that studying music will limit you creatively because you “all get the same education”. If you are unique, you will stand out one way or another. You will not sound the same as everyone else. Being literate in music is never a bad thing. It helps you read music fluently, sight-sing almost anything, transpose to similar instruments, improvise vocal harmonies in nearly any musical style, jam with anybody and hold your own if called on to “take it!” and much more. Without music training, you may think that you are completely free and that one day you might create an entirely new and original genre. But the opposite is often true. Without education, you may develop a stagnant or repetitive style leading to monotonous melodies and musical ideas. So, in the end, you could end up sounding similar to an average musician. But due to the lack of ear training, you might not be able to hear it. If you are a music enthusiast who loves singing or creating music, take a few formal lessons to see how just a bit of formal training can affect your skills and style. Taking voice lessons or piano lessons may be a good start. Formal training doesn’t just benefit you, the musician, but also the music industry you operate in. Through music education, you will learn to effectively communicate not only with other musicians but also with your audience. You will learn how to recognize and create quality music, and how to use your music as a tool to evoke specific emotional and behavioral responses from your listening audience. If you are able to do this, you will be recognized as a successful musician who has the ability to attract an enormous paying audience. Here is why. The primary point of an education in music is to make an artist literate in the language of music. Understanding the language of music doesn’t just give you the ability to read notes and understand rhythmic patterns, but above all, it gives you the ability to create unique melodic phrasings and convey your musical ideas successfully not only to other musicians who understand the language but also to your audience. Knowing the language of music allows you to effectively “speak” with others and express your feelings and emotions through notes in a way other people can comprehend. Being able to communicate with other musicians on a professional level makes collaborating with other artists much easier, and everyone (including you) can follow along quickly. The music industry depends on one thing, and that’s on artists who grasp the value of producing quality music. Lack of knowledge in music theory may negatively affect your flexibility and disable you from creating a piece that will adequately engage your audience. On the flip side, being knowledgeable in music theory will help you create a high-quality composition that will have all the right elements to attract a large paying audience. Music, like other kinds of art, is a powerful tool of expression that can impact and even shape people’s behavior. An interesting fact is that musicians who are particularly interested in understanding the relationship between music and people’s behavior often decide to obtain a degree in behavior analysis. Since music can help an individual experience a wide range of emotional and behavioral responses, knowing how to write music that evokes specific behavioral responses may be the key of getting your audience to exhibit precisely the types of reactions you want to produce with your music. So far as behavior is concerned, value to the industry lies in the ability to reach a specific audience. Music is of no value to the industry if there is no audience, and the audience responds to music based on the effect that it has on them. Because of this, it’s essential for you, as a musician, to understand what impact you can expect your music to have on your audience. Otherwise, you will be making music that is potentially unappealing or continuously play a guessing game in your musical creativity. The more you learn about music, the more you understand how it affects people. When you are aware of what music can do, you can create powerful music. Only when you know how your music affects people, can you create it in such a way to reach and connect with a targeted listening audience. As a result, you will receive recognition in the industry as an innovator in musical expression and sound. Claire is a music enthusiast, a writer and an educator who loves spending her afternoons playing the guitar, singing and drinking huge cups of coffee. For piano lessons Long Island, click here.